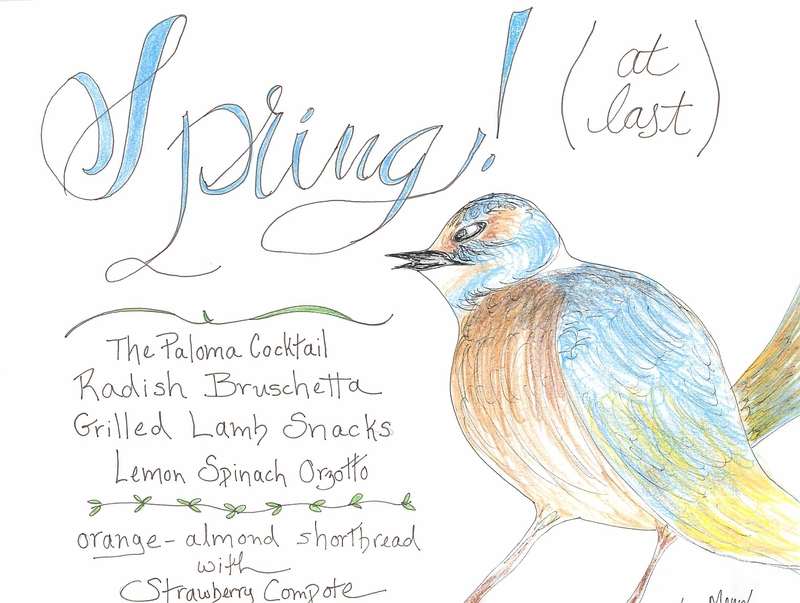 Menu 38 – Spring, At Last!! Are we ALL singing Etta James by now, “At Last”??!?! Spring finally decided to show up and warm us from what was an endless winter season. I mean come on – opening day required beer, hot dogs, hats gloves and blankets. Enough is enough! There is a wonderful tree in front of my house that we watch bloom every year around this time. It’s like watching change in motion as the tree buds and grows leaves. The other night at dinner the kids and I watched a marvelous bird enjoying the breeze and the sun. I tried to replicate the bird here – so proud and happy. Time to celebrate Spring with a dinner. Start with a Sparkling Paloma which is citrusy, so a nice “goodbye!” to winter when citrus is at its best and a refreshing way to ring in the new season. Next a biting bruschetta with radishes. I love radishes and these offer crisp radishes with capers all on top of crusty bread. You cannot go wrong – and they’re pretty. For the main it’s a slight hodge podge with grilled lamb chops – always so good – and a bright Lemon Spinach Orzotto. And to finish, have (almost summer) strawberries in this lovely compote, that you serve with orange almond shortbread. Now THAT is how you ring in Spring. Enjoy it while it lasts!! Posted on April 21, 2016 April 21, 2016 by Kylie SachsPosted in SpringTagged bird drawing, cooking, easy entertaining, menus, Spring, spring dinner.